The result will put the 30-year-old Heymans into the history books as she becomes the first female diver to reach the podium in four consecutive Olympic Games. The diving team of Roseline Filion and Meaghan Benfeito captured Canada’s second medal at the London Olympics. Filion of Laval, Que., and Montreal’s Benfeito won bronze Tuesday in the women’s 10-metre synchronized event. Meanwhile, Antoine Valois-Fortier won a bronze in the man’s 81-kg judo competition. The 22-year-old from Quebec City defeated American Travis Stevens 1-0 to win Canada’s first judo medal since Nicholas Gill won silver in 2000. Just before lunch in Canada, Christine Girard of White Rock, B.C. won the fourth bronze of the Games in the women’s 63-kg. category. The Ukrainian parliament’s press service has announced that a controversial language bill that gives Russian the status of “a regional language” in 13 of Ukraine’s 27 regions has been signed by the speaker. Minutes after I posted, Canada picked up two more Bronze medals! 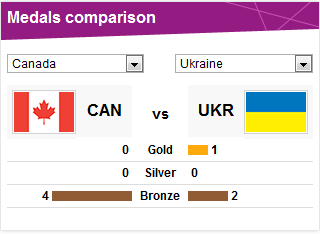 Looking forward to seeing a lot more shiny things for both Canada and Ukraine! Oh boy, another Bronze for Canada in Women’s Weightlifting!